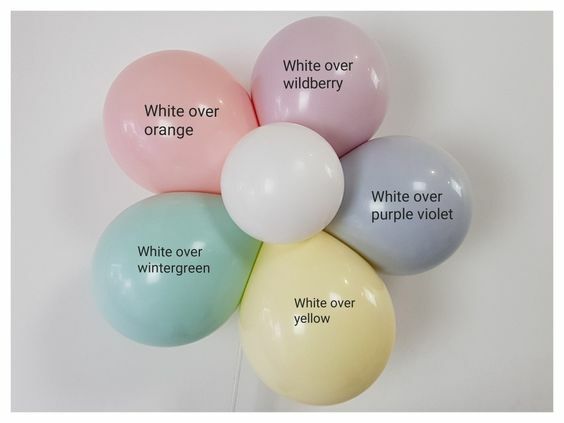 Have you ever looked at some amazing photos of balloon decor and thought the only way to get those exact colours was some heavy photoshop action? 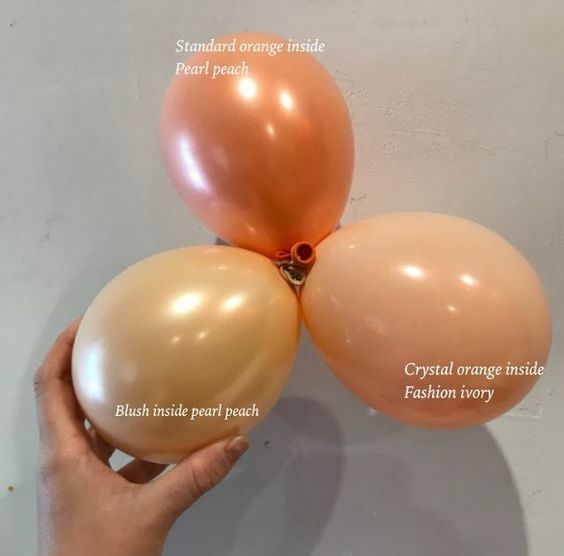 In the past this may have been the case but with our work the past few years, we have been custom blending colours to create the perfect tone. 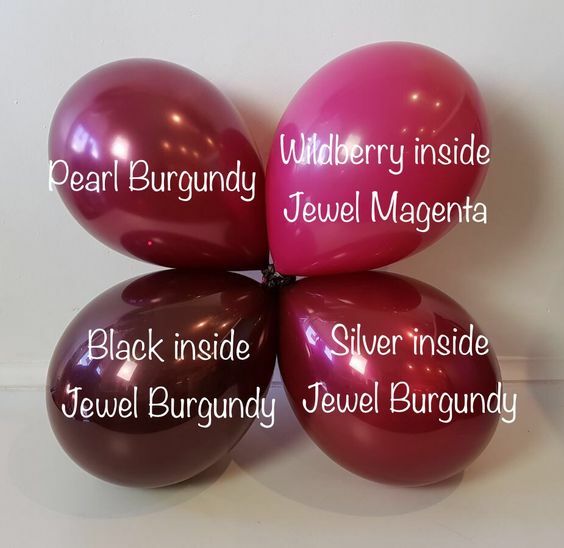 Rather than going offshore months in advance to try and organise a minimum run of hundreds of thousands to PMS match a colour, we are using two balloon colours to create just the right shade. It is a bit of a science – not just the Red plus Yellow = Orange of primary school days! You’d be amazed at how black or dark purple under a light colour creates such depth and a colour you never new existed. It is a very time intensive task (and much harder on our hands!) so there is extra costs involved with this – but I think the one of a kind results are definitely worth it. See what you think – Some examples of our recent favourite colour blend combinations and jobs are below. Grey/Granite/Slate is in my books the hottest trend of late 2017/early 2018! 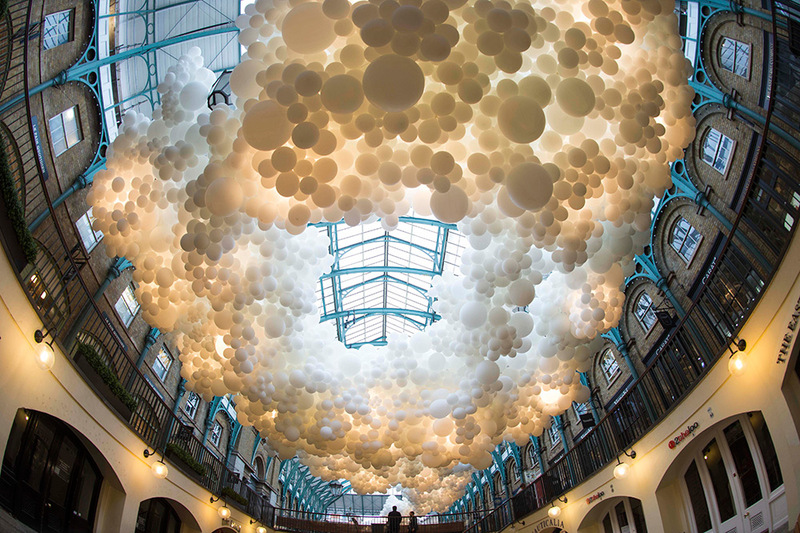 One of the things I love about my job as a Balloonie is being able to create purposeful art. 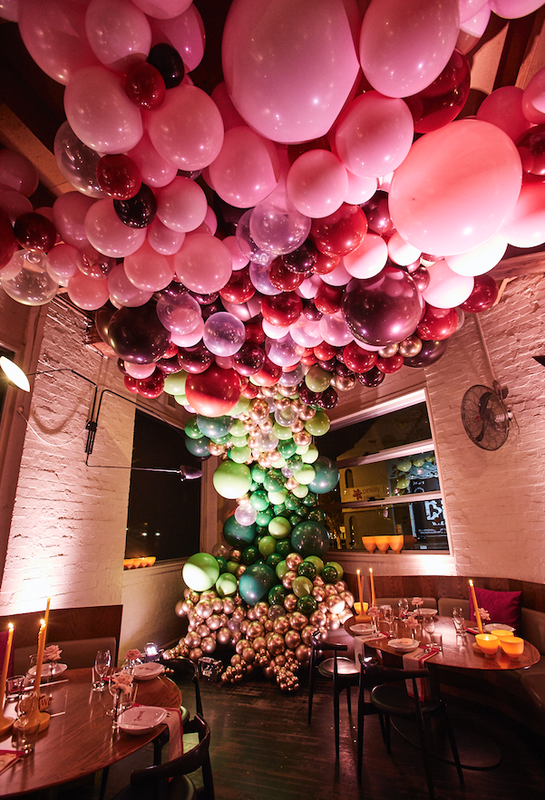 The latest on-trend design element in our industry is Organic Balloon Design. 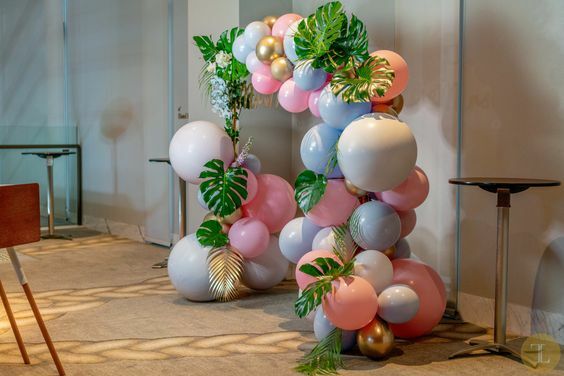 This lovely art form has given my team the freedom to use shape, texture and movement as a medium to not just theme an event, but act as a social expression. It can be quite a challenge to find the right balance with this Organic style. So often we are asked and trained for uniformity and strict forms, whereas Organics is so much more fluid. 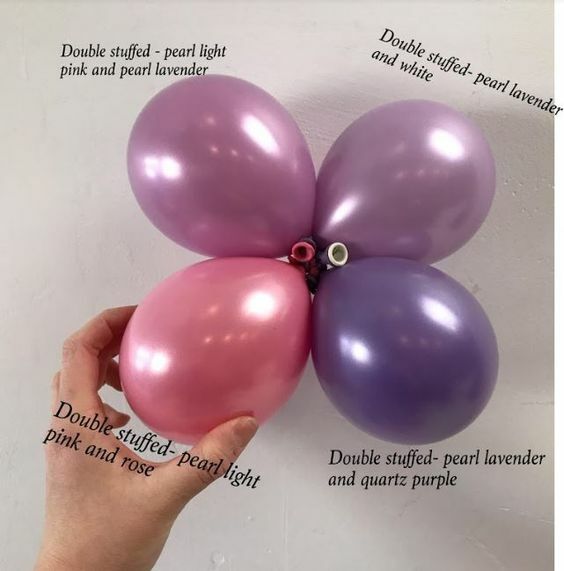 I know a lot of Balloonies in the industry who can be daunted at first, but come to relish and embrace the freedoms it allows. I for one am truly loving all the ways we can make a vision come to life, to suit the design brief, the clients vision and the venue! It’s been so great to see all the balloon art out there filling Instagram and Pinterest feeds. 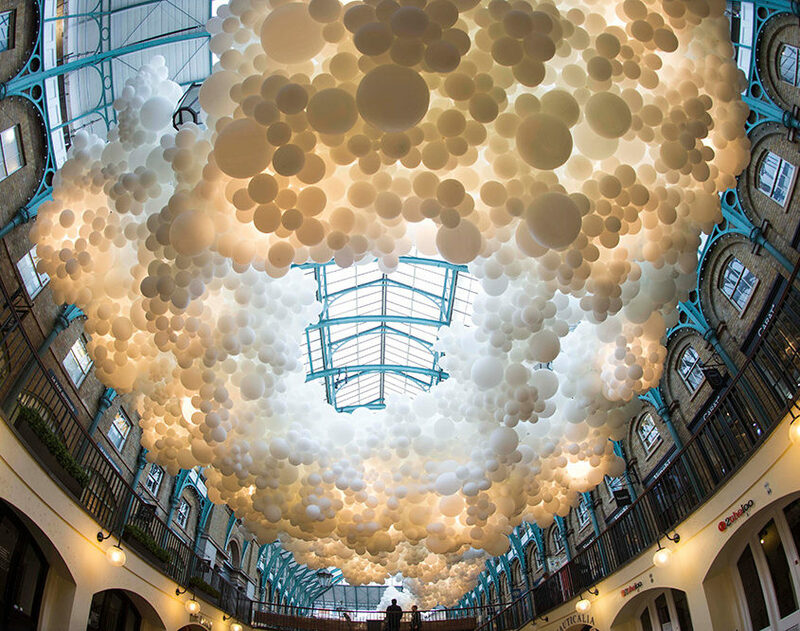 From French artist Charles Petillion’s pulsating Covent Garden cloud installation to LA’s Geronimo Balloons amazing building-scaling constructions, to local Melbournites Belle Balloons vibrant garlands. 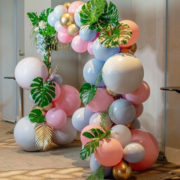 With these artists creating such awe-inspiring work it has given a great reference point for our clients to allow us to create art for their occasions. Here’s a small selection of my favourite organic pieces my team has created recently. 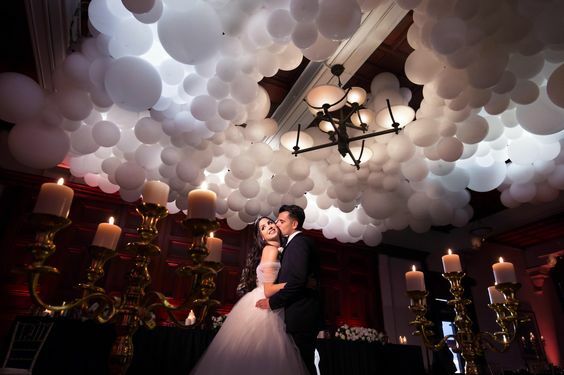 From table runners, to gravity defying Cantilevered Arches, undulating Clouds imbued with soft lighting, hot air balloon sculptures, acres of clean white organic garlands with splashes of Gold confetti and Orbz spanning the entire length of a property. Ahhh! I just can’t pick a favourite – every job has been so fun and challenging. 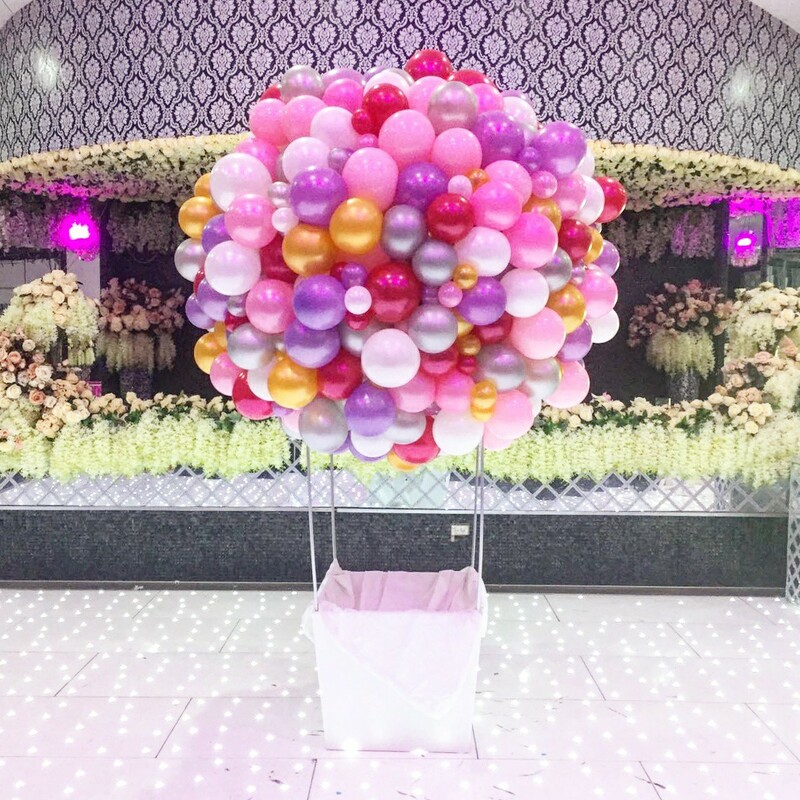 I especially love being able to incorporate new textures and mediums into our balloon designs – using florals, tassels, garlands, metallic Orbz, confetti, greenery, lighting, crepe fans and lanterns. The inspiration just keeps flowing! I’ll let the pictures speak for themselves and hope it brings a little smile, awe and inspiration to your day too! Happy New year everyone! 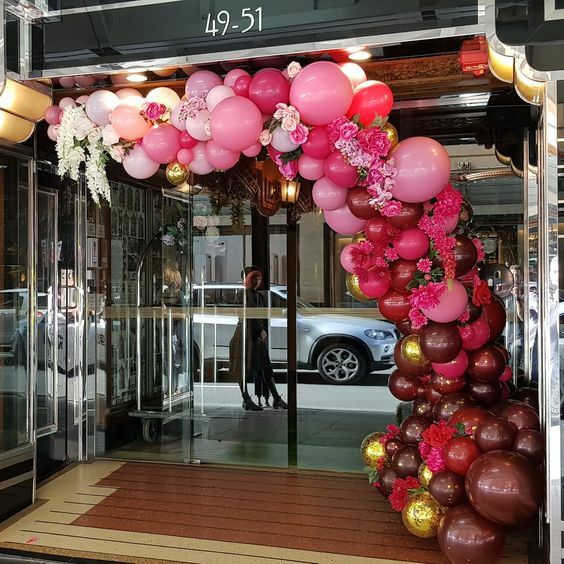 Stunning 18 meters of organic mirror finish garland using qualatex foil balloons. 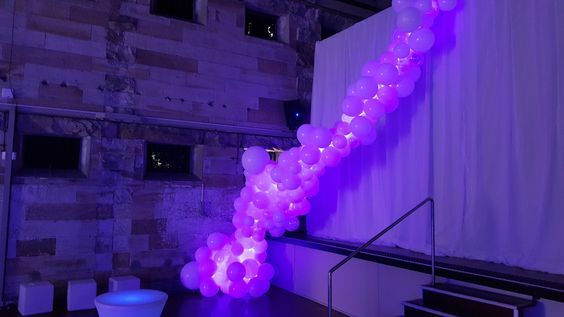 If you love these designs and can see something that you want as part of your event, drop us an email to hi@balloons.net.au or give our friendly team a call on 1300 655 058 to discuss the details. 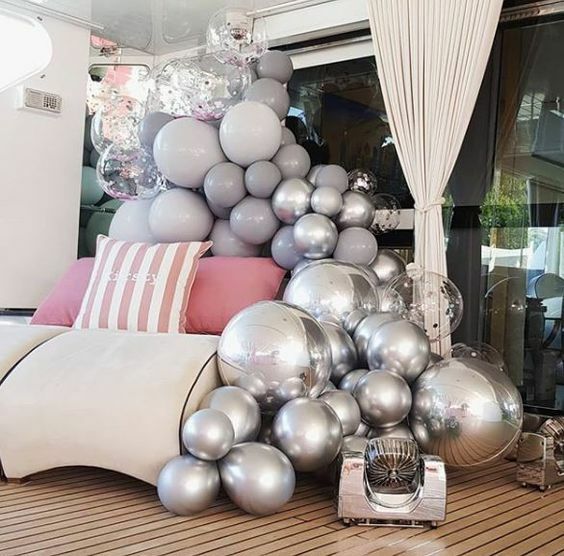 Or if you want some more eye candy have a look at our Instagram or Pinterest feeds to check out even more jaw dropping designs! It’s that time again! When the best of the best in world sport will be competing, all the diehard sports nuts will go two weeks straight without sleep, and everyone else has a collective ‘a-ha’ moment while finally figuring out what exactly the decathlon is*. That’s right – it’s less than two weeks until the 2016 Rio de Janeiro Olympics begins! I don’t know about you, but I’m certainly getting excited. There is no better excuse than the Olympics to go mad with colour. 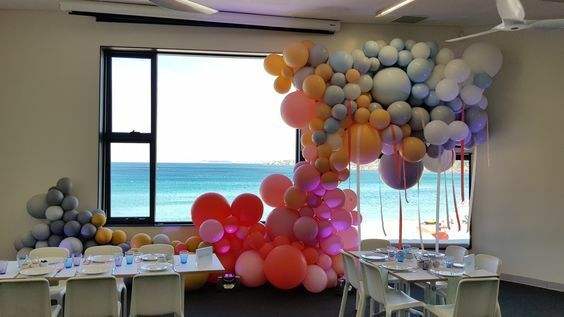 One of the great things about designing balloon decorations in Australia, is that we have so many cultures, every colour has a team! Green and Gold for Australia – add a little blue for Brazil, drop the green for Sweden and don’t forget the Orange if you’re barracking for the Dutch. 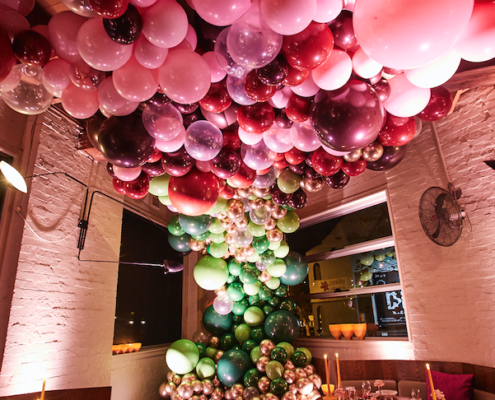 One of the best ways to do this is with our classic helium floor or table arrangements. 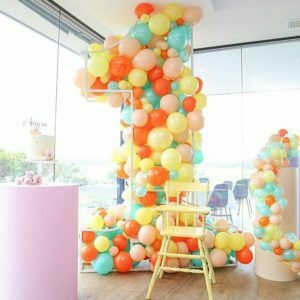 With any number of latex balloons, you can really show your team spirit. Keep it simple with them all the one size, or go a little further and top the arrangement with one of our 16” latex to really make it stand out. Or, you can go even further and show your passion for the games with an Olympic torch like the one our stylist Lindsay created for our shop window in Annandale. Combine it with letters like we did, or have it standing alone amongst your team colours. 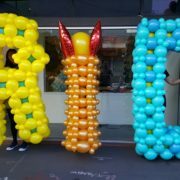 One my favourite ideas is to go all out with our gold and silver Megaloons to spell out ‘RIO 2016’ with coloured weights. 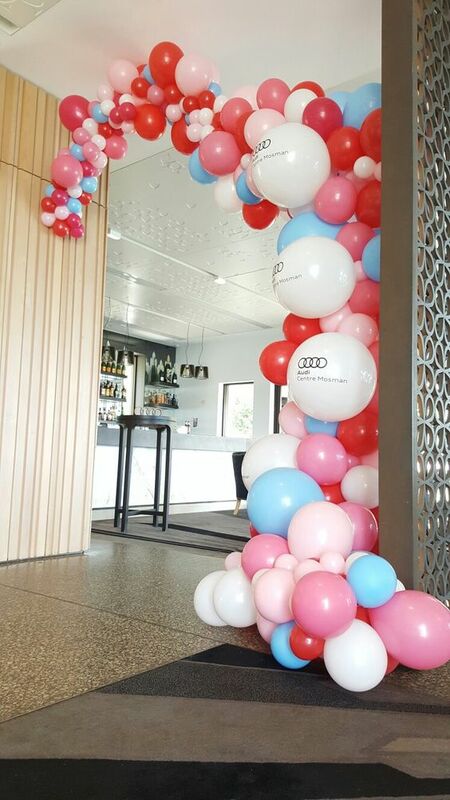 Or why not go for a more subtle look to show your love for the Olympic Values of Friendship, Respect and Excellence and include throw up a string of pearls one of our arches in the same colours? Blue, Yellow, Black, Green and Red. Five colours chosen representing the colours of all national flags at the time of it’s creation, meant to symbolise the unity of all five inhabited continents. Or let us put together some columns for you in the same colours with an Australian flag or Kangaroo on top! Know someone who lives and breathes the Olympics? 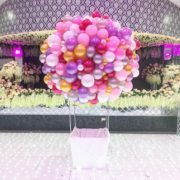 Send them a bouquet to show you understand why they won’t be contactable until the Closing Ceremony is done and dusted!. Try our new Kangaroo walking pet and an Australian flag foil with some green and gold latex for a patriotic feel. 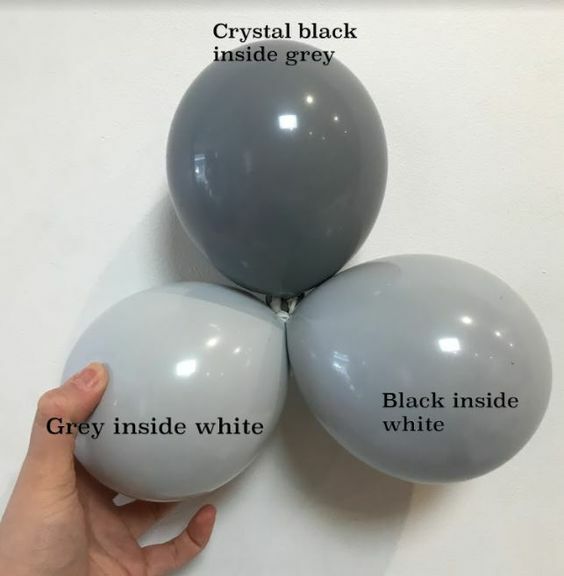 Or, if it’s a Kiwi you want to impress, choose black and white to compliment an All Blacks jersey for when they inevitably win the Rugby 7’s. 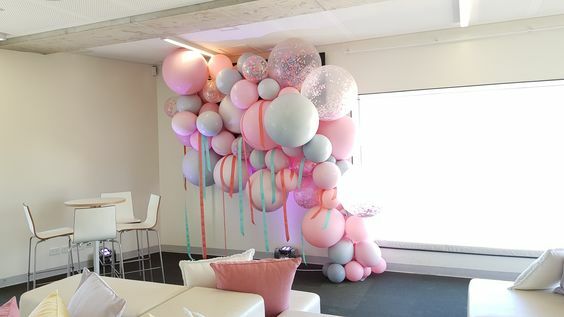 Whatever your needs, Balloons Online is here to help you celebrate the XXXI Olympiad in style. 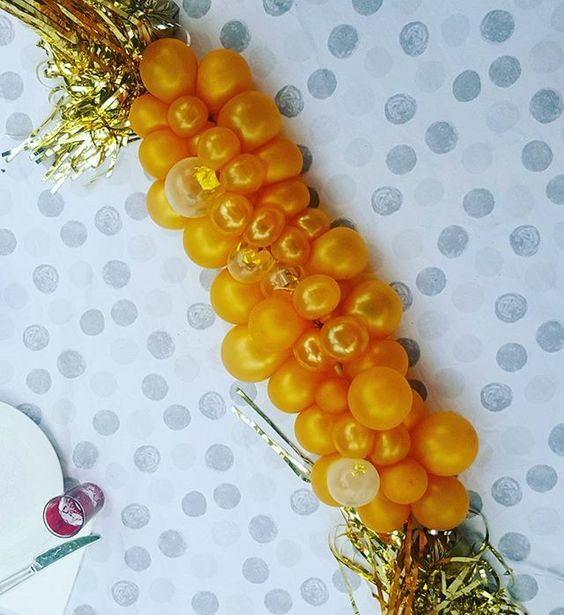 Contact us now to order for your party. Don’t leave it to the last minute…like every Olympic host ever! *JSYI The decathlon is a combined event in athletics consisting of ten track and field events.